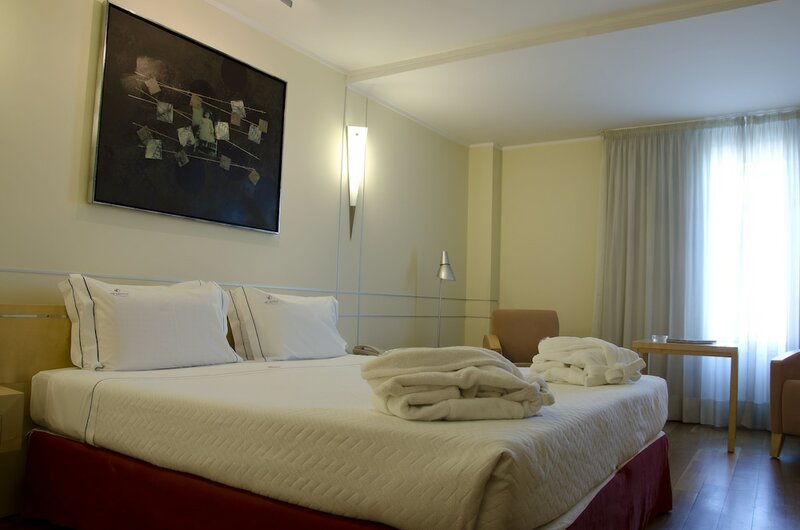 With a stay at VIP Executive Entrecampos Hotel & Conference in Lisbon, you'll be within a 10-minute drive of University of Lisbon and Gulbenkian Museum. This 4-star hotel is 4 mi (6.5 km) from Castle of Sao Jorge and 4.6 mi (7.4 km) from Lisbon Oceanarium. Make yourself at home in one of the 171 air-conditioned rooms featuring refrigerators. Complimentary wireless Internet access keeps you connected, and satellite programming is available for your entertainment. Private bathrooms have deep soaking bathtubs and hair dryers. Conveniences include phones, as well as safes and desks. Be sure to enjoy recreational amenities including an indoor pool and a sauna. Additional amenities at this hotel include complimentary wireless Internet access, concierge services, and gift shops/newsstands. For lunch or dinner, stop by News Caffe, a restaurant that specializes in Portuguese cuisine. Dining is also available at the coffee shop/café, and room service (during limited hours) is provided. Quench your thirst with your favorite drink at the bar/lounge. Breakfast is available for a fee. Featured amenities include a computer station, dry cleaning/laundry services, and a 24-hour front desk. This hotel has 7 meeting rooms available for events. Self parking (subject to charges) is available onsite.